Even in today’s digital world, phone calls are a critical component of generating new business. With the rise of mobile search and click-to-call advertising, optimizing for phone call leads is more important than ever. According to BIA/Kelsey, 65% of businesses consider phone calls to be their most valuable, highest quality source of leads. This is especially important for high-consideration industries like Home Services. When you think about plumbing, electrical, or pest control problems, they typically need to be solved quickly and by a service professional, so homeowners naturally turn to their phone to find and get help fast. At Service Direct, we work with hundreds of home service contractors that are looking to grow their business. Part of our service is focused on generating phone call leads for our clients through hyperlocal online advertising. The other part is focused on tracking and evaluating those inbound phone leads in our call tracking platform. Since we audit tens of thousands of phone calls each year, we have unique insight into the behaviors of consumers, as well as the phone habits of the home service professionals they are trying to reach. When reviewing our 2017 call data, we decided to analyze a random sample of calls across 42 home service categories to better understand how call performance impacts the bottom line. We focused on three key Call Performance metrics. Call Answer Rate: The number of calls answered, relative to the number of calls received. Lead Capture Rate: The number of answered calls where contact information was collected by the business (or answering service), relative to the total number of answered calls. Appointment Booking Rate: The number of answered calls where the business scheduled an appointment, relative to the total number of answered calls. In other words, we wanted to know how often home service professionals answer the phone (i.e. answer rate), how often customer information is collected on the phone (i.e. 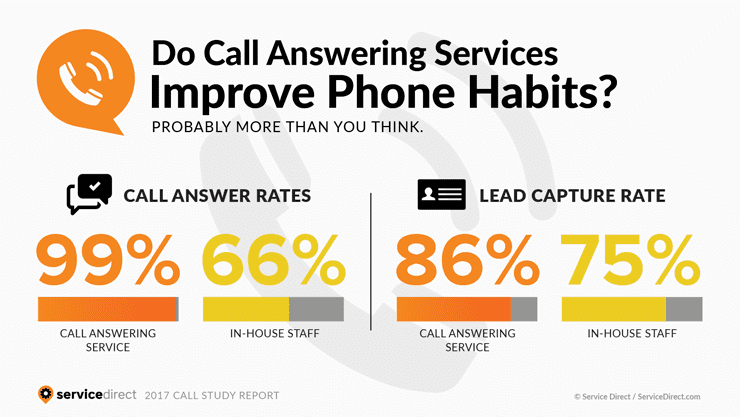 lead capture rate) and how often these calls turn into a scheduled appointment (i.e. appointment booking rate). Home service professionals aren’t answering the phone as much as they think. Business owners estimated they had a call answer rate of 97%, when in reality only 66% of calls were answered on average. The call answer rate for businesses using a Call Answering Service was 99%, while the call answer rate for businesses using In-House Staff was 66%. The majority of inbound calls are from new potential consumers. 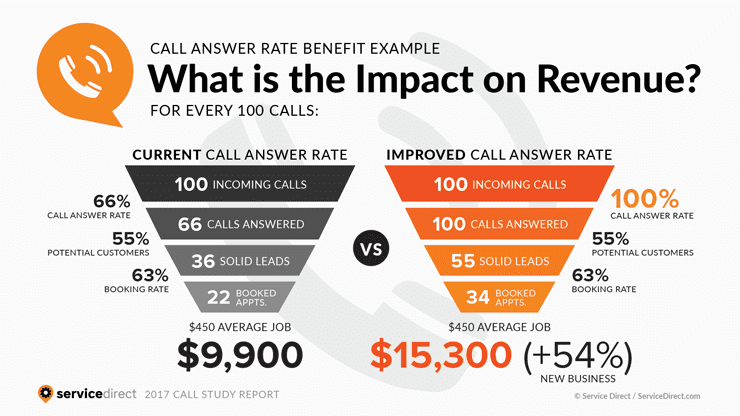 Of the inbound calls answered, 55% were from new potential customers. Call answer rate significantly impacts revenue performance. Businesses could potentially experience a 54% increase in new business by answering all inbound calls. A Consumer Reports survey revealed that 75% of consumers said their biggest gripe is not getting a human on the phone, and when it comes to phone call lead generation, it’s critical for businesses to answer the phone in order to see the return on investment. As such, we set out to understand the percentage of these phone calls that go unanswered. Before analyzing our data, we surveyed home service professionals to ask what percent of inbound phone calls they estimate their business answers. On average, they estimated the answer rate was 97%, or 97 out of every 100 phone calls. 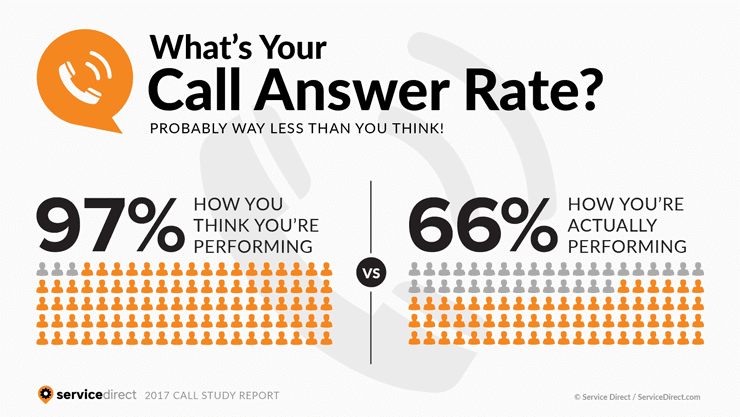 After analyzing our call data, we learned that the actual answer rate was 66%, which is significantly lower than the perceived 97% answer rate. Contractors and home service providers have to wear many hats while on the job, and being next to the phone at all times isn’t always feasible. While many providers may be answering 97% of the calls that they happen to hear or be available to take, there is a significant ‘missed call’ gap that has meaningful implications on the business. According to a Forbes study, 80% of callers don’t leave a message because they do not think they will ever be heard, and according to Message Direct, 85% of consumers whose calls aren’t answered will not call back. We also wanted to learn if there was a difference in performance of third-party Call Answering Services relative to dedicated In-House Staff that are responsible for answering the phone. Third-party Call Answering Services had an average answer rate of 99%, which makes sense because this is what they are hired to do. When the caller was qualified as a ‘new potential customer’, the Call Answering Services succeeded in collecting that customer’s information 86% of the time. By comparison, In-House Staff had an average answer rate of 66%, and were able to succeed in collecting customer information 75% of the time. It is important to consider both the answer rate and the lead capture rate together to fully understand the impact the answer rate can have on a business. A high lead capture rate is only as good as the rate at which calls are answered, and more calls answered equals more leads captured. Out of 100 calls, a Call Answering Service will answer 99 calls and capture 85 leads, whereas In-House Staff will answer 66 calls and capture 49 leads. This is about a 70% increase in leads captured when using a Call Answering Service. According to a study by Google, 61% of mobile users call a business when they’re ready to buy, so after analyzing call answer rates, we wanted to better understand the intent or of these calls. More specifically, how often was an inbound call actually from a new potential customer that the service provider could do business with. New Potential Customer: Calls from homeowners that were in the right service area, that needed a service that the contractor offered, and where the contractor had potential to schedule an appointment. This excludes any calls where the contractor has previously spoken to the caller. Existing Customer: Calls from past and current customers or calls about jobs in progress. Solicitor: Calls from vendors, suppliers or any sales call. Other: Calls from people in out-of-service areas, calls from people asking for a service that the provider didn’t offer, wrong numbers, etc. Of the calls answered by In-House Staff, we found that on average 55% were New Potential Customers. 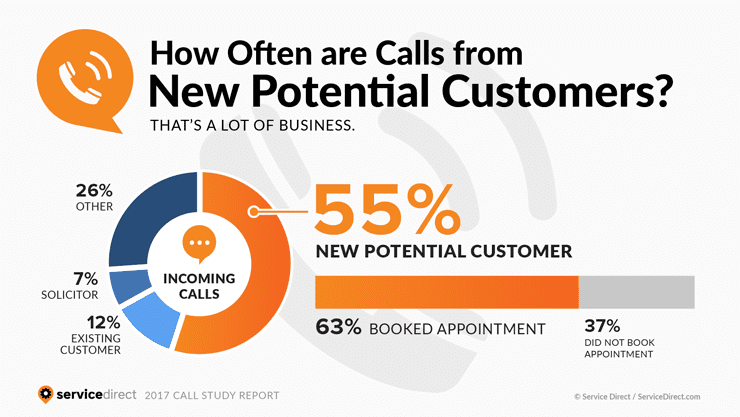 When a New Potential Customer called, an appointment was scheduled 63% of the time. As mentioned, this analysis was conducted across 42 home service categories. Something to consider is that these figures vary according to specific service categories, such as appliance repair or fencing, for example. We estimate that the average home service provider could experience a 54% increase in new business by answering all phone calls (without any increase to existing marketing budget). Home service professionals need to make a concerted effort to bridge the perception gap by accurately and consistently tracking critical Call Performance metrics, including Call Answer Rate, Lead Capture Rate, and Appointment Booking Rate. By fully understanding these metrics, companies can make better and more informed marketing and operational decisions. It is critical for business owners to modernize their telephony system to take advantage of features that will help track, quantify and improve phone habits. VoIP systems are a cost-effective way to bring a small business’s phone system into the 21st century, allowing customization to meet the unique needs of a small growing business and that will maximize profits. VoIP providers like Five9, RingCentral, Jive and Tresta all have features designed specifically to help the needs of small and growing businesses. Below are some critical capabilities using VoIP technology that local small businesses can benefit from without having to hire a new employee or an outsourced answering service. Have inbound calls ring multiple phones simultaneously. Have a call ring several employee phones so that whoever is available can take the call. This helps prevent missed calls due to one employee being busy at the time of the call. Have calls route to certain employees based on custom rules. These rules could include time of day, day of week, cascade in order by seniority, etc. The possibilities are endless. Improve professional image of company through customized on-hold messaging. Businesses can effectively pre-sell their benefits and employees while the potential customer’s call is connecting. Record your calls. A business never has to miss a call by having all calls recorded and stored each day. There is valuable insight to gain from listening to recorded calls including how well calls are being converted into customers, how are your CSRs managing inbound calls, how many calls are going unanswered. You’ll be shocked at some of the things you’ll discover! Missed call notifications and followup. Missing a call means losing out on potential revenue. VoIp systems can notify employees immediately when a call is missed, so that the call can be returned quickly in the hopes of salvaging the potential customer. Consider using a third-party Call Answering Service to answer all calls, vet potential customers and transfer qualified calls to your employees. Given our findings, smaller home service companies could see a significant increase in call performance, and revenue, by leveraging a Call Answering Service during the growth stages of their business. There are many different Call Answering Services specifically for contractors and home service businesses like Ruby, answerconnect, MAP Communications and PATLive that offer services like, 24/7 Answering Services, After Hour Answering Services, Virtual Receptionist, Message Taking, Lead Collection, Appointment Scheduling, Overflow Support, and more. How many calls do you receive in a 24 hour period? If your phone is ringing off the hook and you have a voicemail box flooded with messages, then a it might be good to consider a service like this. How many of your calls are from new customers? If most calls are from new customers, a Call Answering Service could benefit by making sure a new potential customer doesn’t get lost in the mix. How competitive is your business, and your service area? If it’s highly competitive, the risk is higher that a potential customer will call a competitor quickly if they can’t get in touch on the first try. As an online advertising and technology company, we generate thousands of calls for home service clients each year. Our proprietary Call Tracking and Lead Management platform records these calls, and our Call Quality service assists our clients by listening, qualifying and scoring these inbound call leads. This data was collected by our Call Quality team during those recorded interactions for commercial purposes rather than for market research. We analyzed a random sample of 1,000 of these recorded phone calls specifically for our home service clients throughout 2017. This dataset includes calls from 94 US-based home service clients of all business sizes, across 42 service categories including Plumbing, HVAC, Electrical, Pest Control, Restoration and Handyman services. We listened to an average of 10 calls per business to better understand their phone habits, and the call behavior of consumers. These findings exclusively represent inbound calls generated from our pay per call search advertising campaigns for our clients. As such, these findings may not be indicative of the market as a whole. Expert commentary solely represents the views of the individual. Chart values are rounded to the nearest whole number. Service Direct is an online advertising and technology company that offers performance-based lead generation solutions for local service businesses. Founded in 2006, Service Direct has been helping professionals in home services, legal services and financial services grow their business for over a decade. Service Direct is a Google Premier Partner and was recognized on both the 2016 and 2017 Inc. 5000 list of the fastest growing private companies in the country. For more information, please visit: www.servicedirect.com.